The Justice League gathers at the Watchtower. J'onn J'onzz, aka, Martian Manhunter stands apart from his fellow team members, unsure how to fit in. J'onzz walks the reddened landscape of Death Valley pondering his purpose and place in a world not his own. In Tokyo, J'onzz borrows the identity of Detective Yamada. He is tracking a serial killer by the name of Thoth, an alien who claims to have killed the entire Martian population while Manhunter was off planet. Police cordon off a murder scene at Thoth's latest victim's apartment. J'onzz watches as Thoth comes out of hiding, tearing himself out of a forensic analyst's body as though it were a plastic bag. As Thoth reveals himself, he tells J'onn after inhabiting so many different bodies, he has forgotten his true self. He is simply known as "The UnNamed." Manhunter and The UnNamed fight. But the killer needs a new body to inhabit. He finds an old man, however J'onzz acts quickly. Manhunter takes the old man's mind, storing it within his own. Caught off guard, and with no mind to feast on, The UnNamed is left vulnerable. J'onzz obliterates his foe in two punches, leaving no trace of him. J'onzz has found his purpose on Earth. He likes humans. He will save them. He will be a hero. Story - 3: As soon as Bryan Hitch was announced as the writer and artist for a new Justice League book, doubters questioned his ability to meet a monthly deadline. Issue #4 was late, and this, the fifth installment, checked in seven weeks behind schedule. When it did hit stands, Hitch's story, script, and pencils, were nowhere to be seen. Instead we get the ending to a jettisoned Martian Manhunter back up from two and a half years ago. Though I am sure this will bother some, I am up for most anything, as long as it is a well told story. 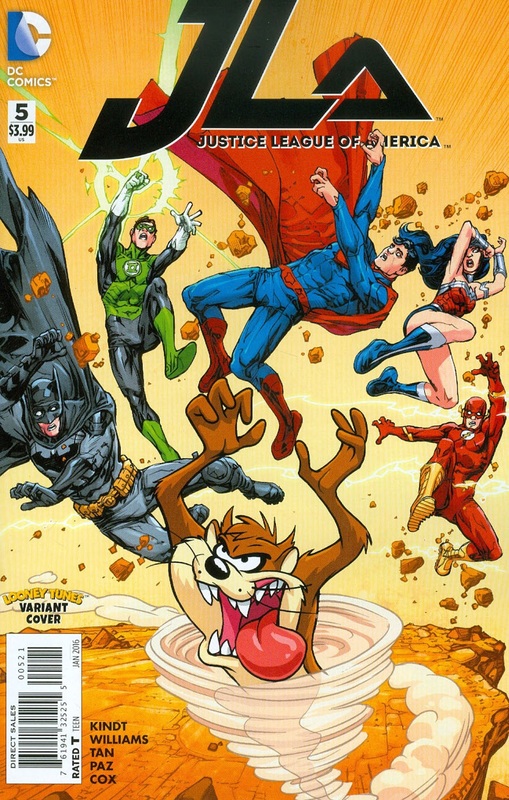 I appreciate the glimpse into the private life of a historically important JLA member, and there are interesting concepts and themes in this issue. Not to mention the fact that invisibility and telepathy might be the coolest powers ever. We do not see heroes put these powers to use enough in the DCU. J'onzz origins have not been explored in detail enough to make the story seem tired. But ultimately, this tale was thrown together too quickly. The idea is simple: Martian Manhunter is a man without a home. He defeats the creature who killed his people. And accepts his new role as a superhero of Earth. There is nothing wrong with simplicity. But the story is underdeveloped. Someone shots feel crammed. As if the concept is too large to fit into a single issue, but this book has the opposite problem. 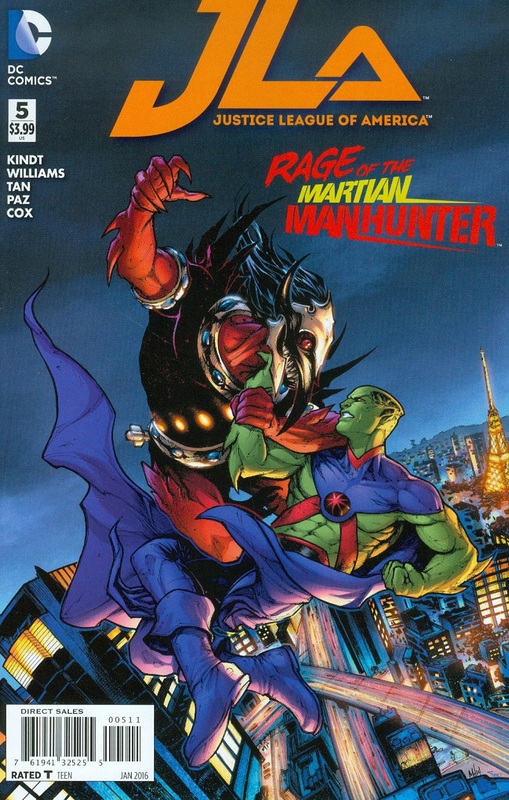 Matt Kindt originally wrote this Martian Manhunter story as an eight page back up, as a result he never put the proper detail and framework in. When editor Brain Cunningham scrambled to fill this month's edition with finished work, he turned to Kindt, and Rob Williams. Williams, who is writing the current solo title, had to piece the backups together to form a cohesive whole. The rush job shows. In the opening scene, J'onzz stands apart from the rest of the team, he lacks the social skills to fit in. That is a nice start, but not enough to send him on a journey of self discovery. J'onzz has been tracking an alien serial killer Thoth, later dubbed "The UnNamed." But how does J'onzz know his nemesis is in Tokyo? Why does the villain obsessed with our favorite martian? Why does J'onzz believe his name to be Thoth, when it is actually The UnNamed? (An unnecessary and confusing twist/change) Some of these answers are touched on, but some are ignored altogether. There is an interesting moment between J'onzz, when he assumed the identity of a Japanese detective, and a female coworker. Great romantic and moral tension. But it is cut short before anything promising can develop. Why? J'onzz mentions his proclivity to forget that assuming someone else's identity is illegal. Does mean he is morally opposed or indifferent to the action? Perhaps he keeps things strictly business because he is still faithful to his deceased wife? Or maybe he is not attracted to humans in the first place? Maybe he is just focused on the task at hand. We will never know. The spark, the tension, the conflict: all cut short because the plot was first set for eight pages not twenty. A shame. Art - 3: Note to DC editorial: Never let Philip Tan ink himself. He does so on the first two pages. It does not go well. It is scratchy, rushed, and a bit lacking in detail. When Jason Paz comes on, he saves the day. His effect is to make the work cleaner, sharper, and most importantly, clarify facial expressions. Despite some awkward poses, and confusing panels, Tan's finished work has a pleasing look to it. But more than anything, the artwork feels like a good artist rushed a few pages through for a backup, not realizing that it would be used as a feature. The most arresting aspect of the cover is the character design for The UnNamed. While the cover artist is not responsible for that, she did a great job at making an already visually interesting villain shine.